Hella New Zealand, the most far-flung subsidiary of the German automotive electronics giant, holds a reputation as being one of the most innovative and successful subsidiaries in the group. 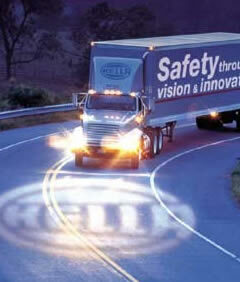 90% of Hella NZ's products are exported, including truck lights; submersible trailer lights; marine deck lights. Hella also produces custom OEM designed lighting for carmakers - including eye-catching eye-level brake lights for the Porsche Carrera. To cope with some of the volume truck/trailer products, the company enlisted the assistance of a small 6-axis Staubli robot. 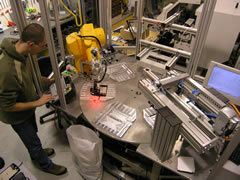 The robot dispenses glue in a process that holds particular risk for manual assembly workers, requiring repetitive wrist motions. One of the challenges facing Hella in looking to automate this gluing process was how to get the required precision for some of the finer dispensing operations. Also, with no manual inspection involved and the glue not visible in the final assembled product - how do you ensure that the glue was applied correctly? Hella asked ControlVision to implement a robot guidance and inspection solution to solve this problem. Based on ControlVision's VisionServer software for Cognex VisionPro, the system uses three Sony HR cameras. Two cameras are used for vision guidance, allowing a small dispensing needle to accurately mate with tiny glue targets on the lamp assembly. A third, high-resolution camera is used to inspect the glue prior to mating the two halves of the lamp assembly.